When I first saw Mario Kart DS in E3 2004, I always wanted to play that version. However it seems it wasn't available. So I've tried my best to replicate it. Also I noticed in the original beta either the back tires are bigger or maybe just wider. A new version of this hack has been released. As always, the old version is still available to download. Does Multiplayer work when one plays the original MKDS and another plays this Beta Replica? And does it work when both two people who play have the Beta Replica? So you still didn't give up on low quality CTs, by calling it "Pre-Alpha Replica" as your sole excuse? It doesn't seem like he has, and he most likely wont, he's been doing this for quite while now. We've been telling him these things for almost a year now, I think it's clear what we tell him wont have any effect. Not tested, because I don't have real DSs. I'm still trying to improve, as long as I improve my modeling skills. Those objects, which cause the CTs to be low-quality, are just placeholders, if I improve my modeling skills, I remove those objects, and import the new model and re-create the KCL. I feel stupid, but...... How do I use these downloads? I tried to run them on DraStic DS emulator, but they won't show up! WHAT AM I DOING WRONG!?!? 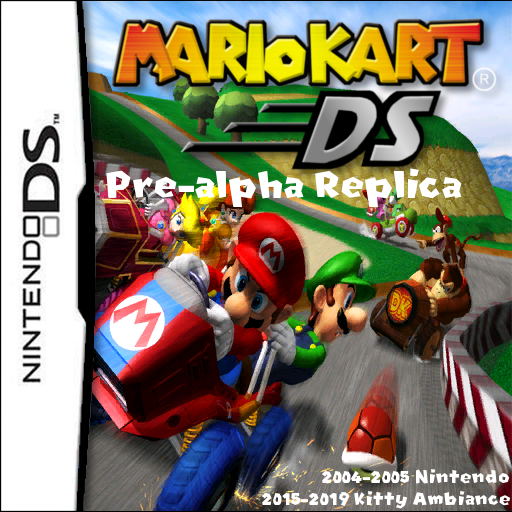 Get Xdelta and patch the downloaded file to a clean ROM of Mario Kart DS. Who all can I unlock in this version? Version 1.2 of this hack is released. This version includes new models, improved track quality and improved music. Well, I have to give credit where credit is due, some of the Karts look nicer, and the Music Hacking is some of the most advanced I've seen in a while, some of the music sounds pretty good. But, aside from the Music, most of the things in this hack will never work on a real DS. and the hack won't even boot on a real DS, I tried it. It's pretty much an emulator only hack. Plus, I see you're still using that method of hex editing NSBTA files, which causes a real DS to crash. Nintendo at least had the actual Alpha working on real hardware, with little issues, and clean looking when shown to the public, this isn't any of those things, and is still very far from the Alpha. I see you're also following things off unfinished maps, "unfinished" being a key word. Most of the touch maps lack certain details, simply because they weren't added, not because the tracks were literally going to be that way. OK. I would make it low-poly when possible. Here is a dropbox link for it, all I ask is that I get to use it too lol. The model you sent came without textures. For good measure, you might as well give out the .obj, .mtl and .png under the same name. Sorry, Ive never been able to make custom characters because I could never get the textures to work.... Here is the dropbox link for the textures, there are a bunch of them so beware lol.